Ahmedabad is the largest city and an important business hub of the Indian state of Gujarat. Identified as a shopper?s paradise, the city throbs with markets selling clothes, bags, home decors, jewellery etc. With the shopping and business moving to online platforms, lot of software companies have emerged in Ahmedabad. Developers who are competent in scrum framework have bright career options in Ahmedabad, thus making it a wise move for them to gain knowledge on scrum. It is in this context that KnowledgeHut offers instructor-led CSD certification in Ahmedabad as a technical assistance to aspiring software professionals. What is the course all about? Advantages of scrum framework for agile development come in the form of good quality software while cutting down the development time. Method being iterative, these principles provide better control over the project code and timelines. CSD course in Ahmedabad is a comprehensive program led by an expert tutor. During the first phase, the course focuses on the fundamentals of scrum framework. Second phase focuses more on technical components. CSD training in Ahmedabad through practice sessions on actual scenarios is sure to build confidence in the minds of developers for the successful completion of Scrum-driven projects. Benefits of the course: CSD training in Ahmedabad makes developers competent in using scrum framework. It provides CSD certificate which proves their fundamental and technical knowledge in using scrum framework for development. With CSD certificate, scrum alliance website allows them to have their own profile page and specially designed logo to make them stand ahead with CSD credentials. 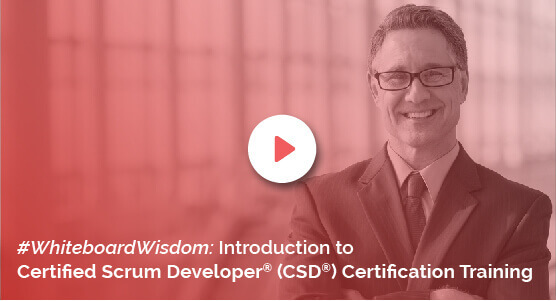 CSD Certification in Ahmedabad also provides comprehensive course material, downloadable e-books and 100-days free access to agile and scrum e-learning program. The KnowledgeHut Way: KnowledgeHut?s Certified Scrum Developer Certification in Ahmedabad is provided at a very competitive fee which includes Scrum Alliance Certification Examination cost. Give an edge to your career with CSD Certification in Ahmedabad.